Braces vs. Invisalign – Which is Right for You? Can you believe 2019 is coming? That means another year full of activities, social events, and adventure in general. So, whether it’s for yourself or for your child, it may be time to invest in a plan to straighten your teeth. But should you pick braces or opt for Invisalign? At Jacobson & Tsou Orthodontics in Chicago and Vernon Hills, we offer both Invisalign and traditional braces as great options to straighten teeth. By considering your individual teeth, goals, and preferences, we can help you choose which option is right for you. Traditional braces, the most popular orthodontic option for teeth straightening, are made of a system of brackets and wires. Brackets are attached to either the front or back of the teeth using cement and wires and elastic bands are connected to those brackets in order to apply constant pressure to help straighten teeth. Your orthodontist will schedule appointments to replace the bands and adjust the wires every 6 - 10 weeks. Invisalign is the process of using a series of clear aligners to increasingly straighten your smile. Unlike traditional braces, Invisalign is both wire and bracket-free. Initially, your orthodontist sends impressions of your teeth to create aligners. Once the Invisalign aligners are made they must be worn sequentially, contingent upon your orthodontist’s approval at regular check-up appointments. Appointments with your orthodontist should be scheduled every 8 - 12 weeks to monitor progress and receive the next aligner when ready. The most significant difference between traditional braces and Invisalign is the fact that Invisalign is the “almost invisible” orthodontic option. Since Invisalign uses clear aligners, the treatment is less noticeable than its braces counterpart. Invisalign aligners are also removable, which means there are no restrictions on what you can eat while using this orthodontic option. Additionally, this means there are no limitations to your oral hygiene routine. Overall, because Invisalign is removable, there is a minimal effect on your lifestyle but an effect on your teeth. Although, some patients who tend to snack all day rather than eat regular meals find having to constantly take out aligners to eat inconveniently. Those patients prefer traditional braces since they can snack with them on (they just have to eat softer foods). Unlike Invisalign, traditional braces are not removable. This means there are certain limits in place to ensure the safety and efficiency of your orthodontic equipment. While using traditional braces, avoid eating foods that are either too sticky or too crunchy. You will also need to be especially vigilant with your oral hygiene, working to brush and floss between braces. Naturally, traditional braces are the more noticeable option for your orthodontic needs. Keep in mind though, while they aren’t clear like Invisalign, traditional braces have come a long way aesthetically. The brackets are now smaller, come in less noticeable colors, and can even be placed on the back of the teeth to minimize how visible they are. 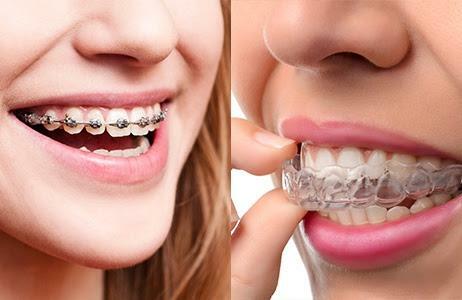 The cost of both traditional braces and Invisalign depends on several factors, for example, the severity of the orthodontic problem, your dental insurance, and any work to restore braces or Invisalign aligners that are damaged/lost throughout the process. Typically, the cost of traditional braces ranges from $2,500 - $7,000, while Invisalign costs from $3,000 - $8,000. Book a consultation with Jacobson & Tsou Orthodontics at our Chicago or Vernon Hills office to discuss the specific pricing you can expect for either traditional braces or the Invisalign system. Call Jacobson & Tsou Orthodontics Today! Start the New Year out with a step toward straighter teeth and a confident smile. Whether you decide to get braces or Invisalign, Jacobson & Tsou Orthodontics of Chicago and Vernon Hills will help you move toward your smile goals. Your eligibility to receive either Invisalign or traditional braces depends on your unique orthodontic needs, so schedule a consultation now to discuss with an orthodontist if braces or Invisalign may be right for you. We can’t wait to see your smile!